Claims that the recovery has not reached beyond Dublin usually occur without hard evidence. That is not surprising. Despite the frequency with which those claims are made, the available evidence shows that all counties and regions are recovering by most measures. This column analyses the available evidence in depth and an accompanying column in the main section of this newspaper looks at political and policy implications. Part of the reason for the lack of evidence in many claims about rural Ireland being left behind is because there are only a limited series of up-to-date statistics on a county or regional level - something not altogether surprising given the small size of the country and the cost of collating data at the micro level. A further problem is that many sub-national statistics that are available usually include areas which are a mix of rural, urban and somewhere in between. In the meantime, we have to make do with what is available. The accumulated evidence provides no support for the more extravagant claims (such as "the recovery has not gone beyond the M50") and only very limited support for the claim that there is a two-speed recovery between urban and rural areas. Is rural Ireland dying? No, is the short answer, even if fears of a depopulated countryside are more than understandable. Over the course of human history, no trend has been more universal and more constant than urbanisation. The move from the land into towns and cities has happened across the world. It continues to happen everywhere. Ireland's extraordinary demographic history, which saw 120 years of population decline from the 1840s, is utterly unique in the world. The folk memory from this extended period, of decline and large-scale emigration, can only heighten fears about rural decay. But since the early 1960s, Ireland has had the strongest population growth in Western Europe. Every county has seen its population rise over that period. This is in contrast to many parts of Europe, particularly those countries whose populations are stagnating and falling. According to Eurostat, Ireland is one of the European countries which experienced an increase in its rural population in the four years to 2015. Most European countries experienced falls over that time. According to CSO estimates, between 2011 and 2015 six of the state's regions experienced population increases. The Border and West regions have experienced contractions, the former by almost 4pc and the latter by 1pc. Thus, it is only in the border counties where there is any evidence to support concerns about depopulation. Employment is probably the best indicator of the country's economic health. A regional breakdown of jobs growth shows very clearly that the recovery is not isolated to the capital (the CSO divides the country into eight regions in its huge quarterly jobs survey). Indeed since the turnaround three years ago, the Border, Midlands and South-East have all registered stronger employment growth than Dublin, as the accompanying chart shows. However, a signification exception to the good news story is the West. The number of people at work in that region is only slightly above the nadir reached after the crash. Certainly, by this indicator, Enda Kenny's infamous "whingers" may have a point. It should also be said that even with the bounceback in recent years, every region - including Dublin - remains some way below their peak employment levels of 2006-07. This illustrates well that despite a solid recovery across the country, it has not brought the economy back to pre-crisis peaks. As the number of jobs in the economy has increased, joblessness has fallen too. Regional unemployment rates have been falling in every single region bar none. In the fourth quarter of 2015, the lowest rate was in the South-West at 7.4pc. Closely followed by Dublin and the Mid-East - the two most urban regions - at 7.6pc. The South-East has the state's highest unemployment rate at 11.9pc. Despite the strongest employment growth, the Midlands is one of three regions with a double-digit jobless rate. The other is the West - again, the folk of the Taoiseach's region really do have something to gripe about when it comes to the labour market. A final point is worth making as regards jobs. Agriculture remains a crucial part of the rural economy, employing over 100,000 directly and many more indirectly. Employment in the sector took a hit during the recession, but has already surpassed its pre-crisis level, one of the few sectors to have done so. The CSO publishes average per head income by county on an annual basis. Again the trends are positive, almost without exception. Disposable income (after taxes) has been rising everywhere. 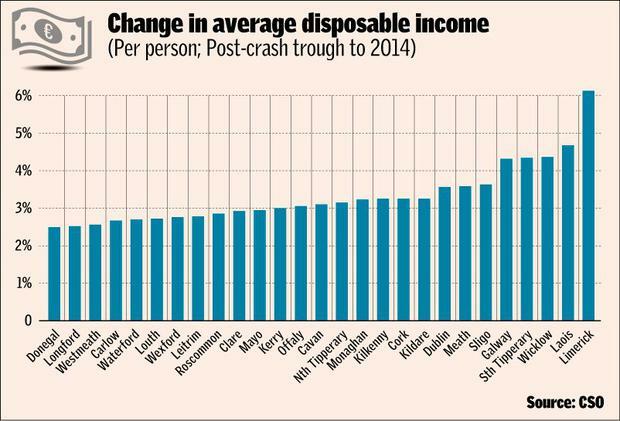 As the chart shows, the change in disposable income per person from each county's respective low point until the latest year available (2014) has actually been remarkably similar across all the counties. It is also important to note that the counties which have done better at growing disposable income in recent times are not necessarily those that are the most urbanised. Again, this measure does not support the notion that the recovery is happening only in cities, or only in Dublin. The case for more taxpayers' money to be channelled to rural areas is often made by rural TDs. That large transfers from urban to rural Ireland already occur is heard less frequently. For instance, in terms of income tax, corporation tax, capital gains and VAT, Dublin pays 55pc of the total despite only having 28pc of the population, according to Revenue data by county. This can also be seen in the household income data compiled by the CSO. In 21 counties, households receive more social transfers than they pay in tax in the aggregate. The exceptions are Dublin, three of its adjoining counties (Kildare, Meath and Wicklow), Kilkenny and Cork. With the exception of Kilkenny, all these counties are among the most urban in the country. When farm payments from the EU's Common Agricultural Policy are added, amounting to €1.7bn in 2014, the scale of transfers from urban areas to rural is larger again. The CSO breaks down its residential property price data regionally only between Dublin and non-Dublin. Over the past 18 months, prices in the capital have stagnated after a couple of years of rebounding very strongly from the post-crash low-point. The trend outside Dublin has been different. Prices stabilised later and were slower to recover, but since 2014 they have risen much more rapidly than in the capital - increasing by almost one fifth between June 2014 and February this year. This would simply not have happened if the economy outside the M50 was stagnating. After a home, a car is usually the biggest purchase many of us make. When the crash came, new vehicle sales collapsed - from 181,000 cars in 2007 to 54,000 two years later. By last year, sales were still well down on pre-crisis levels, but recovering very strongly, having risen by 100pc or more in 23 out of 26 counties. Again, the difference in the rate of growth of new car sales in urban and rural counties has been very modest and, for instance, Cork has had one of the slowest rebounds, while Roscommon has had the second strongest post-crisis growth. Stephen Maguire Gardai have issued an appeal for witnesses amidst local speculation that yesterday's huge wildfires in Co Donegal may have been started deliberately. Martin Coughlan The Kepak Athleague quote for hoggets fell last week by 15c/kg, while Kildare Chilling dropped their hogget quote by 10c/kg.